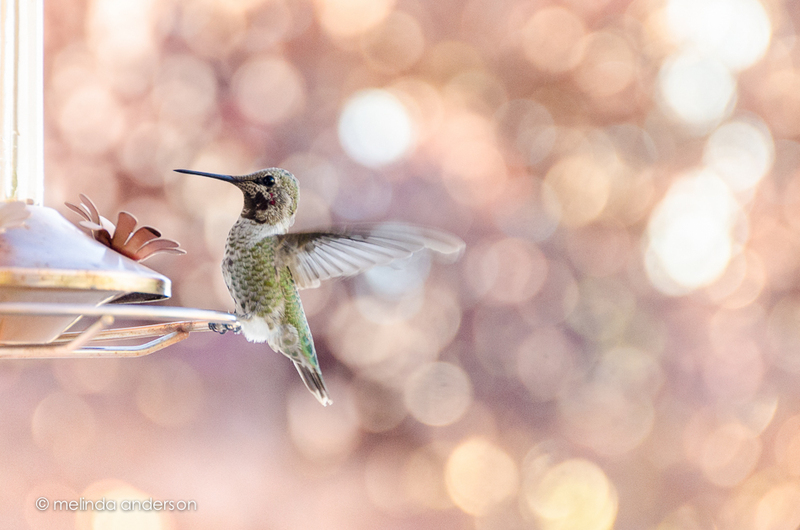 This summer the Prescott hummingbirds have finally discovered us! 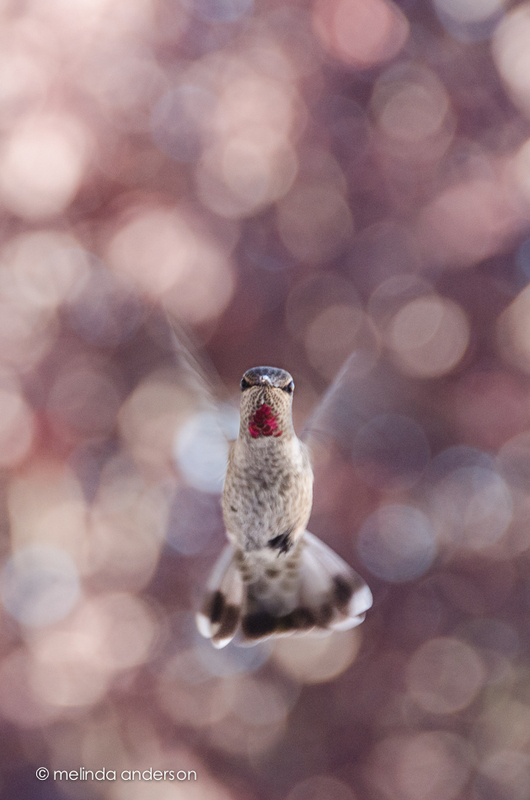 In fact I’ve seen as many as five flitting around at a time, buzzing each other in a seeming fight for territory. 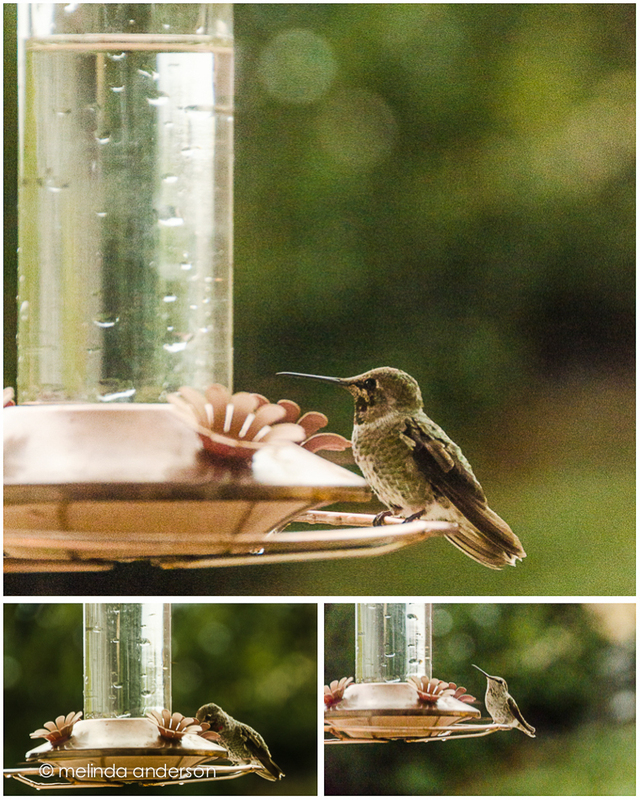 Our feeder is right outside the window by the kitchen sink, so I’m constantly watching them. 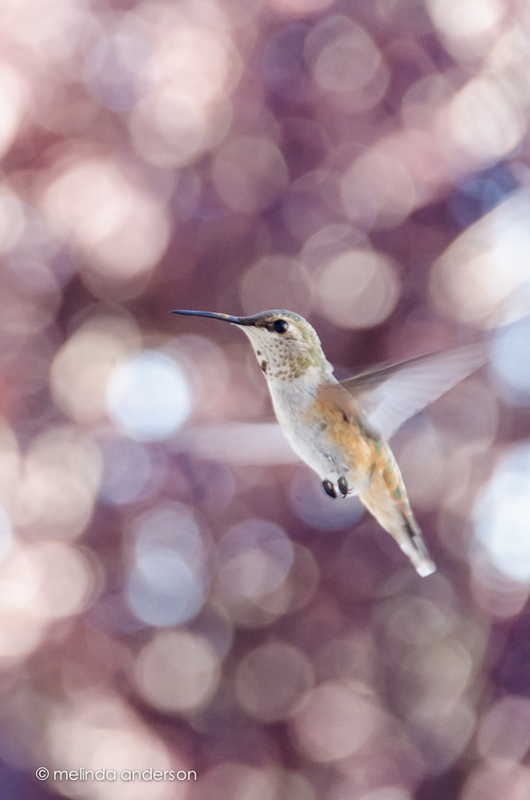 I took my camera outside a couple days ago and had fun taking photos as the little hummers flew around me. They got closer and closer to me, trying to scare me off- but I held my ground! 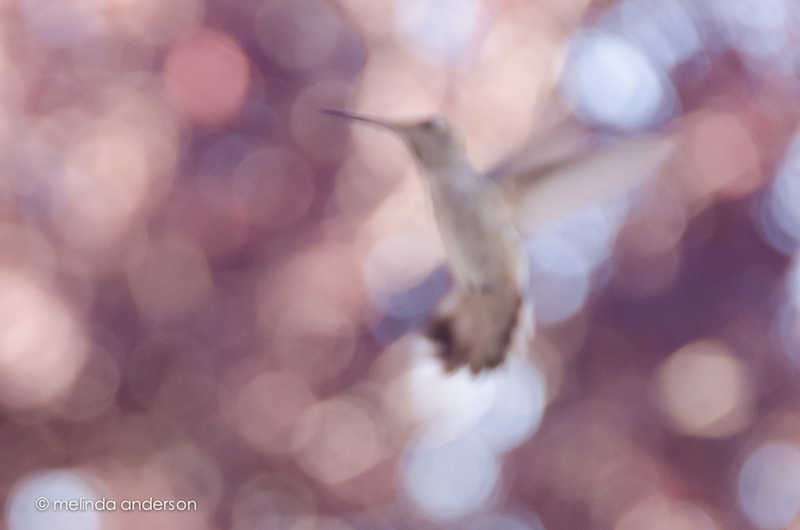 Hummingbirds can be a challenge to keep in focus- but this out of focus one ended up being one of my favorites of the session. 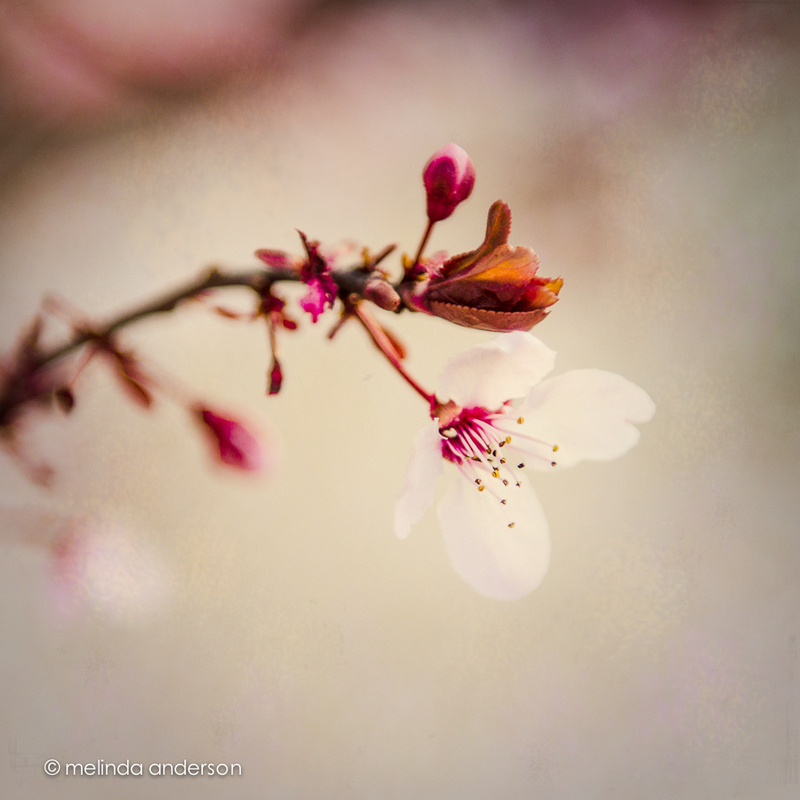 BTW the bokeh is from the morning light shining on the plum tree in the background. I like this darker, textured version as well. Yes, I did take some shots that were actually IN focus! I love this one- he was staring me down! What a bully! 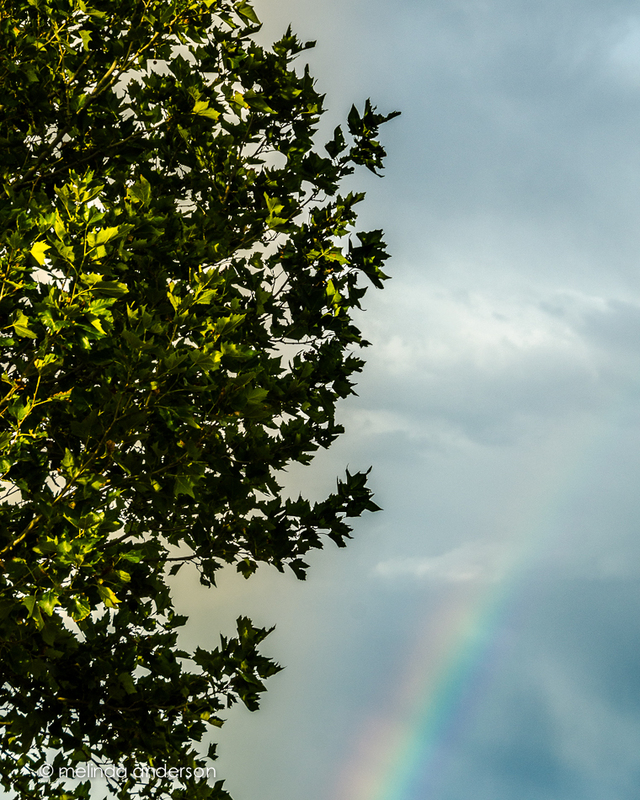 We had some rain late yesterday afternoon- and a rainbow. 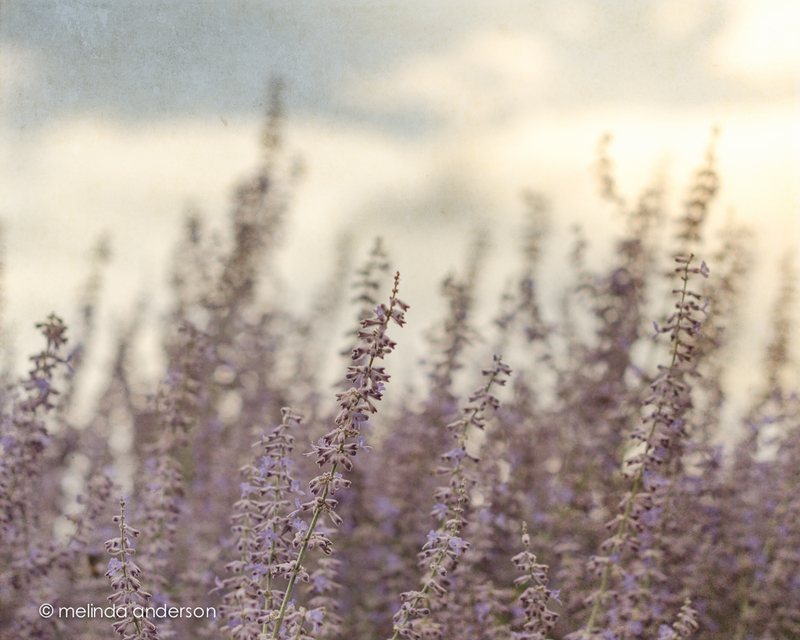 After I took a few rainbow photos, I turned around and took these two photos of the pre-sunset light shining through the Russian sage. Always turn around! Of course, I had to convert one to black and white. This was taken about 15 minutes later with my iPhone. 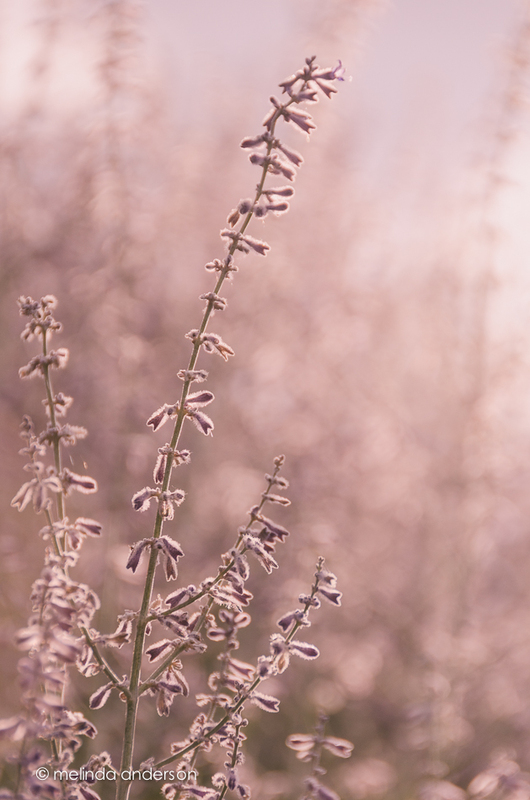 I photographed my huge Russian sage (although not a native plant, it seems to pop up everywhere), on two different days over the weekend- and what a difference a day makes. And here is Sunday’s! I have to give my husband credit for this one. He looked out the window while we were watching TV (still binge-watching Damages! 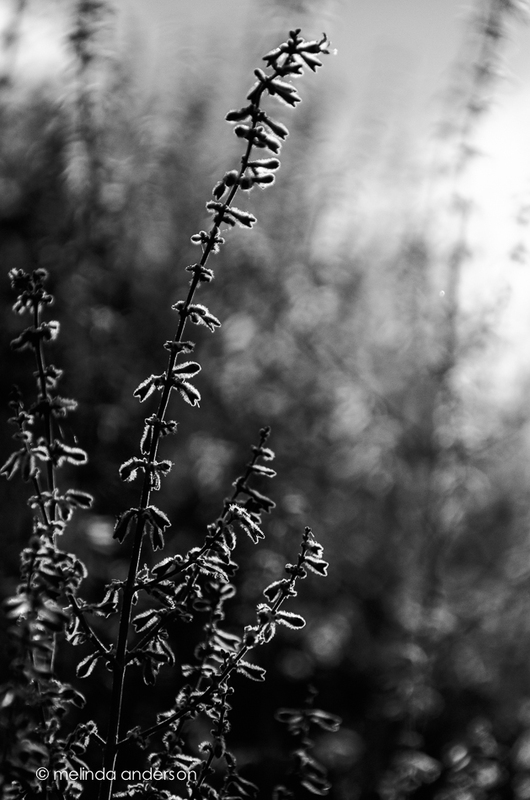 ), and exclaimed over the light in the clouds. While he paused the TV, I ran out and captured this one before the light changed. 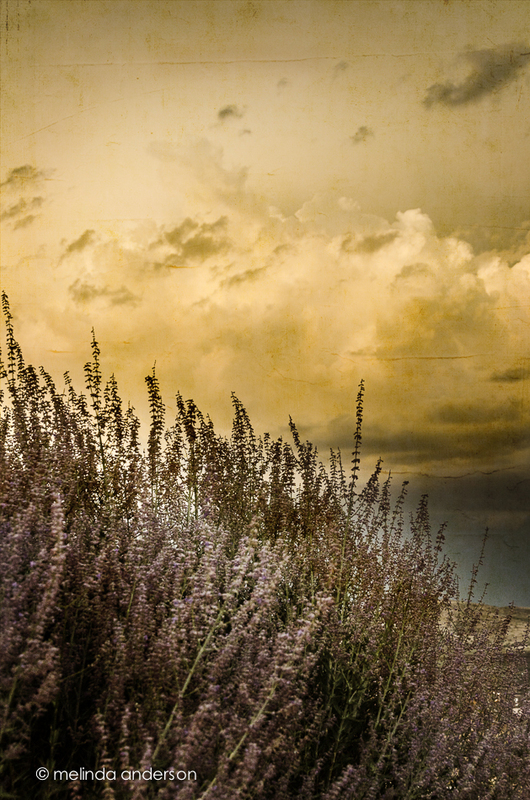 Both photos are textured with Kim Klassen’s textures- golden and waterfront11 on the first, 1301 on the second. 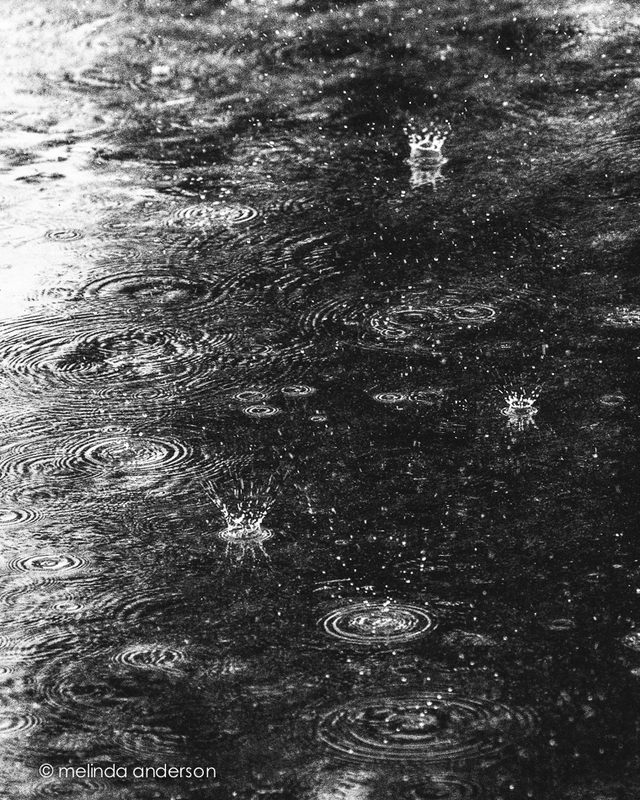 The rain- and after . . .
We had our first HUGE monsoon storm yesterday- thunder, lightning, heavy rain, flooding (not at our house) and power outage! 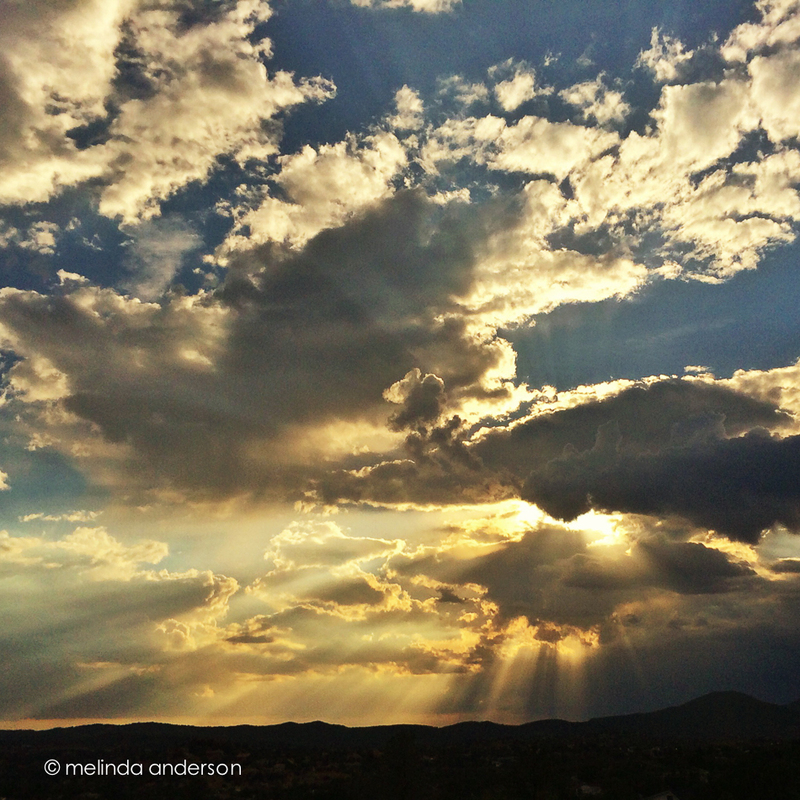 After hours and hours of rain and sky drama, the rain subsided in the early evening. 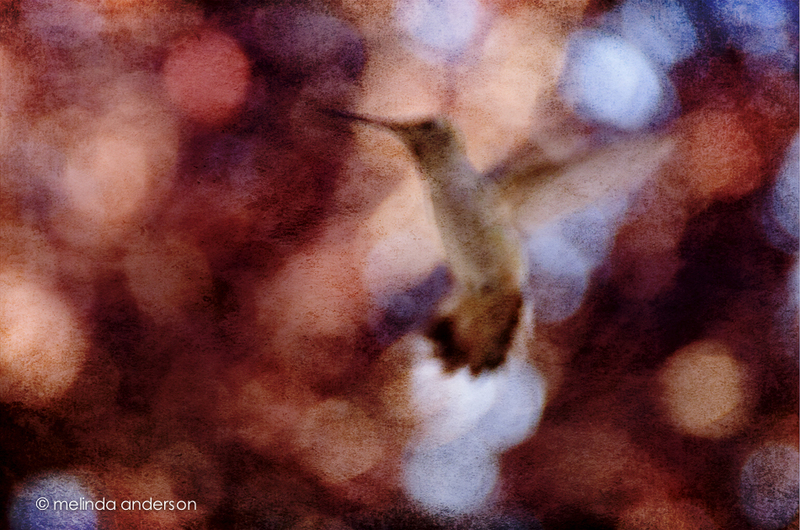 The hummingbirds dashed to the feeder, and all was back to normal in the high desert. And then the storm resumed . 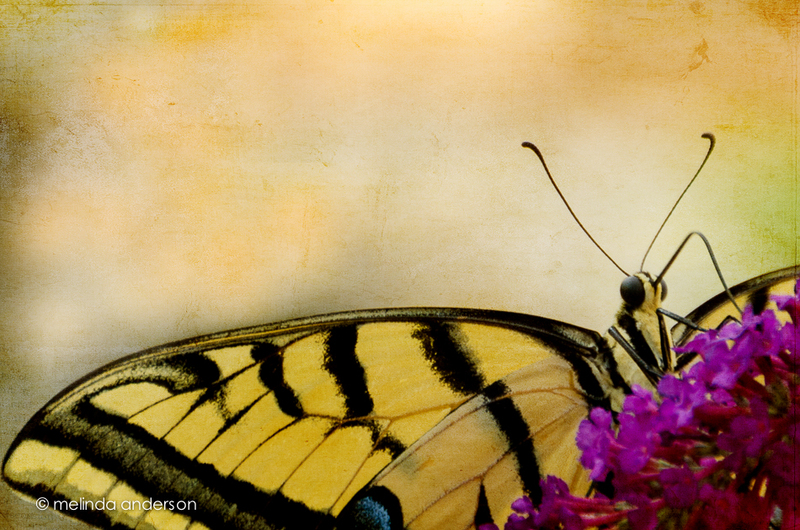 . .
On Tuesday, I posted my favorite photo of the cooperative swallowtail that had been visiting our yard. Today, I am posting three more photos and am hoping he will make a return visit! 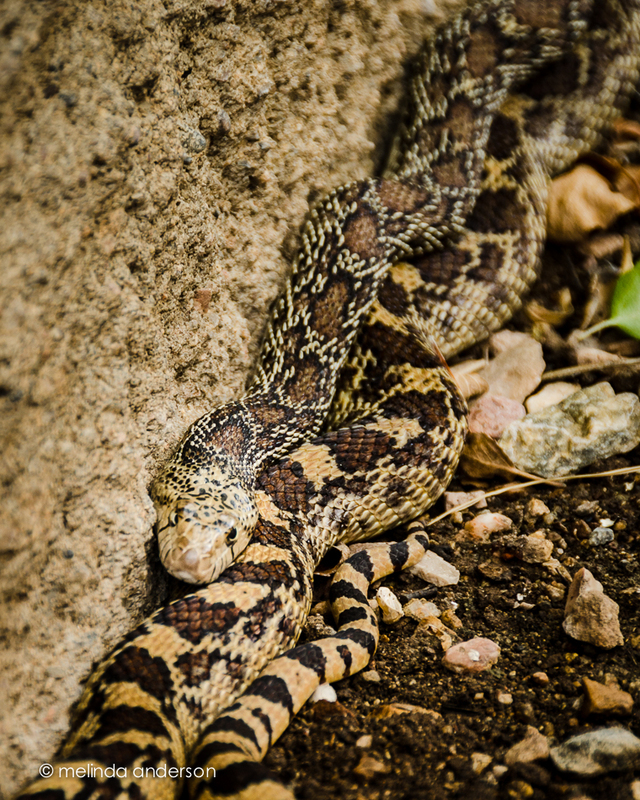 A few weeks ago we had some drama in the front yard involving a brave bunny and a scared (and scary) snake. 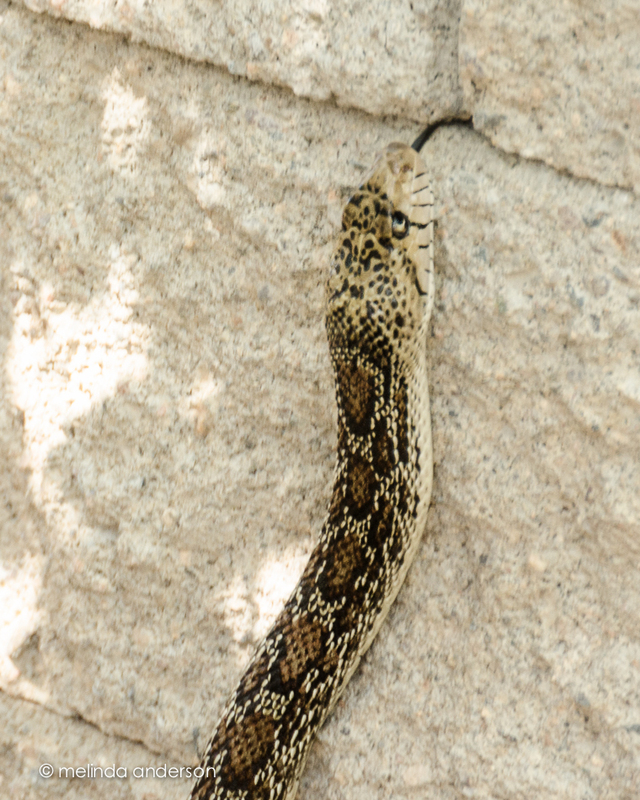 The short version is that, as I was looking out the window, the cute bunny in the front yard hopped, almost running, across the yard and leapt onto a LONG snake (which I had not noticed was there). In a flash, the bunny and the snake were rolling around, the snake was attempting to climb a post on the front porch, and then the snake slithered to safety inside an small evergreen tree out of the bunny’s reach. 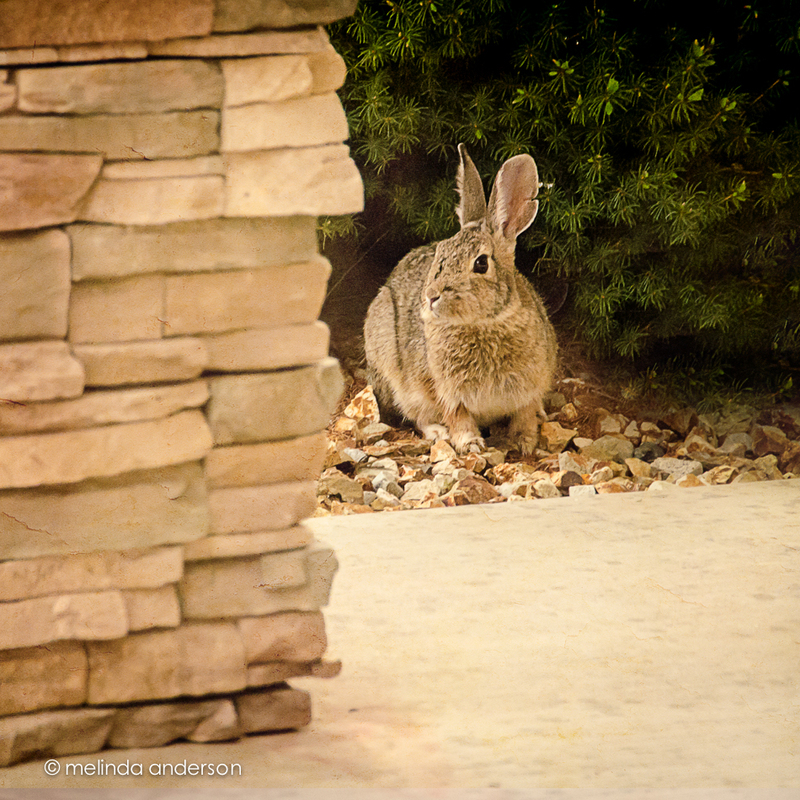 The bunny stalked that snake for two days- and then no more action. Flash forward to yesterday. . .
Carol (who is staying with us) and I were getting ready for the day, when my husband informed me that there was a “little snake” in the back yard. 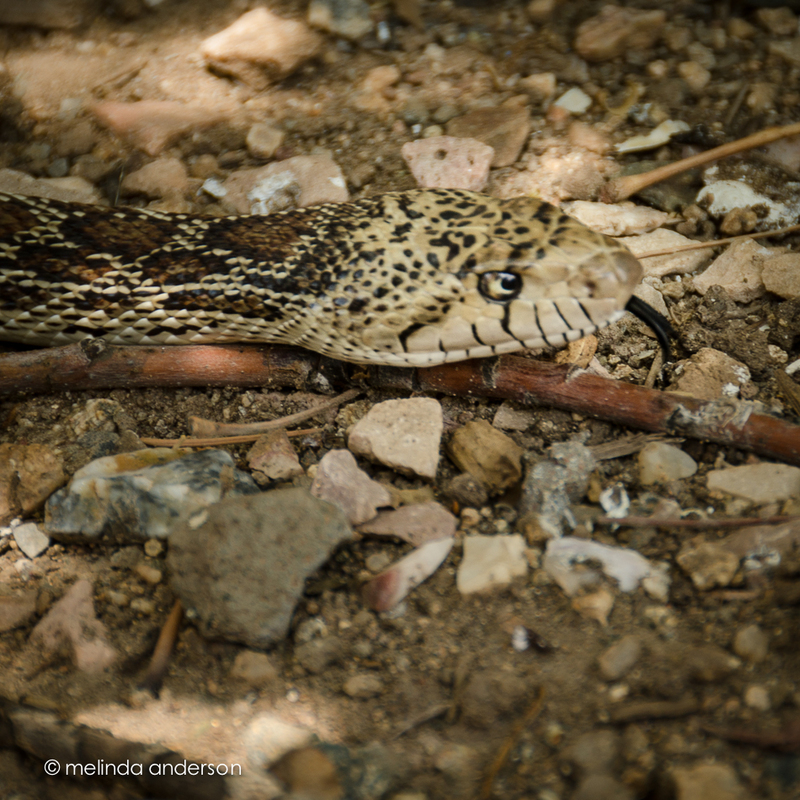 I went out and was horrified to see a very large (probably 4 feet long) snake slithering around under the apple trees. It looked like the snake in the Snake and Bunny Saga. I grabbed Carol’s camera with its fancy 400mm zoom lens and clicked away- from a safe distance. When she joined us, I reluctantly gave her camera back and eventually got close enough to take photos with my 18-200mm zoom. 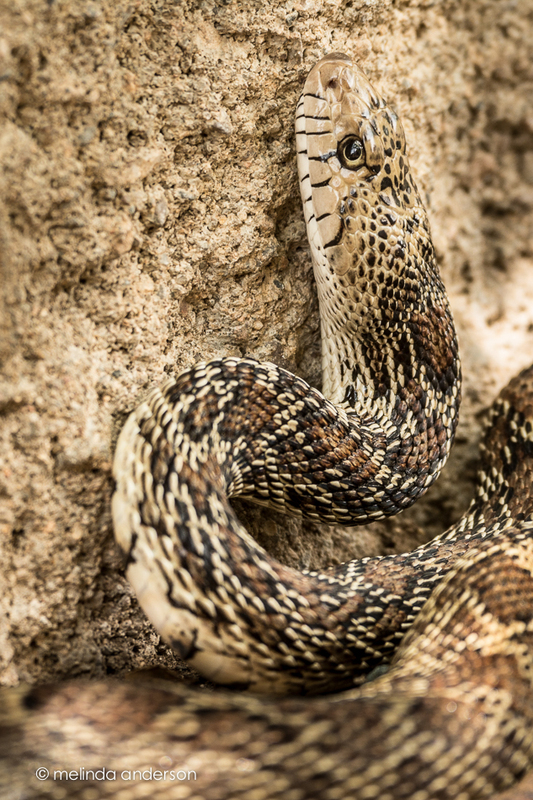 Carol identified our heretofore unknown snake as a Sonoran gopher snake- and, sadly, we found that he has a hole under the apple tree where he apparently- ummmm- LIVES! 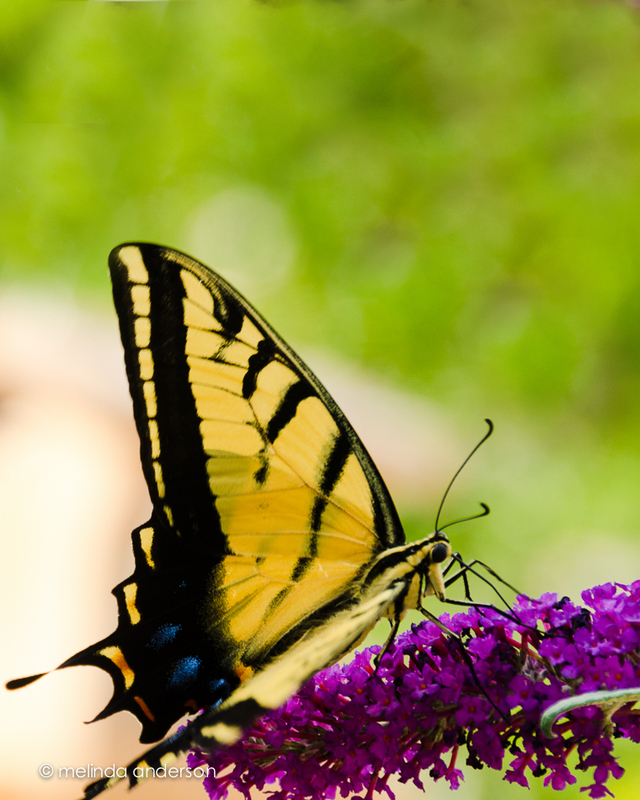 We’ve had the most cooperative swallowtail in the yard the last few days! 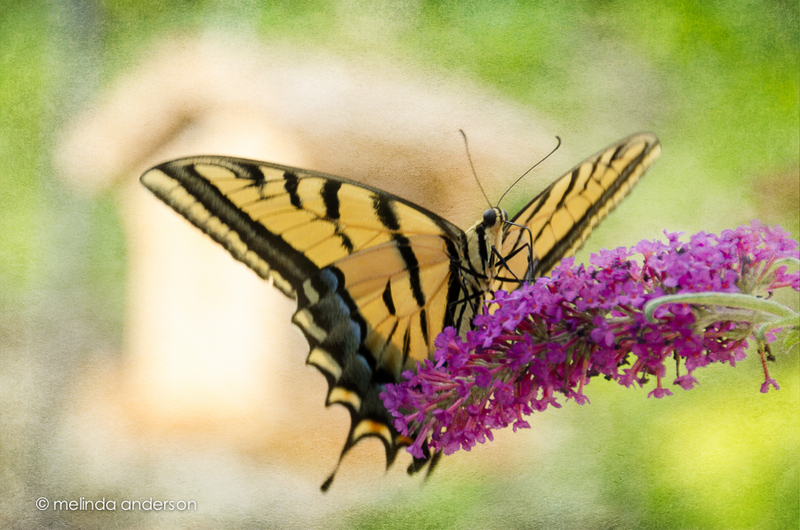 It allowed Carol and me to get however close we wanted while it sipped nectar from our butterfly bushes. 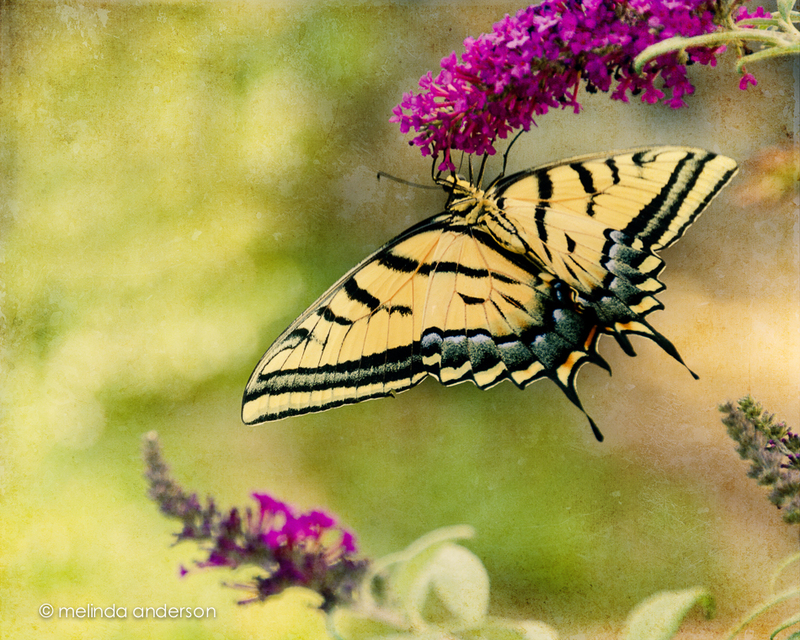 Carol, true to form, looked up this particular swallowtail online and determined it to be the Two Tailed Swallowtail, Arizona’s state butterfly. I took dozens of photos of the butterfly, but am partial to this almost out of the frame shot of it checking me out as it drank. 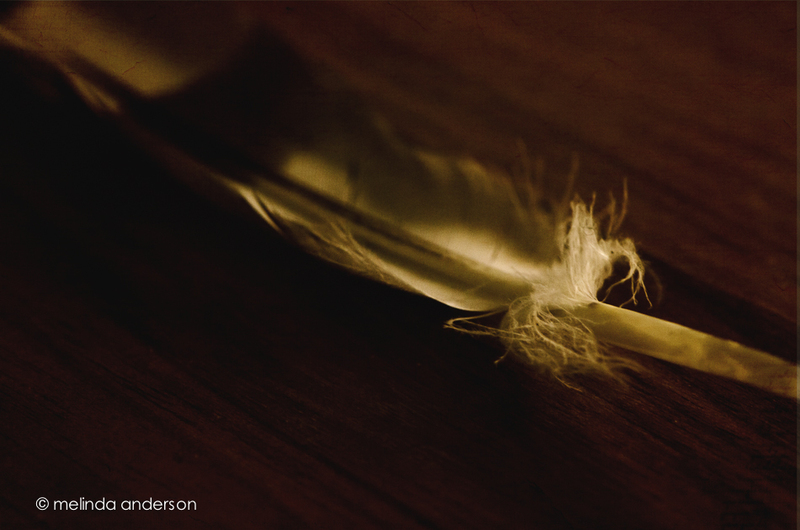 Textured with Kim Klassen’s 2203 for Texture Tuesday. Look what my husband found in the yard the other day (I have trained him well!)! 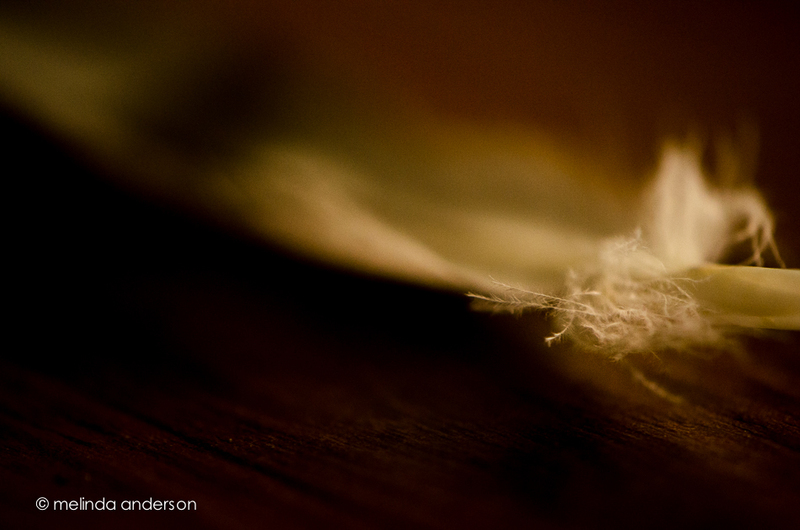 It’s long and striped, but it’s the little fluffy part I was attracted to for this macro shot. Since I’ve been back, I’ve been catching up on life, and my photography work has consisted of culling and editing photos from Yellowstone and getting images edited and printed for my photography groups. I was also 2 or 3 weeks behind in Start to Finish and Be Still 52 (Kim Klassen’s classes), but knew I would have time to catch up soon. A couple days ago I started going through the lessons I hadn’t done and found myself feeling inspired again to create a still life. 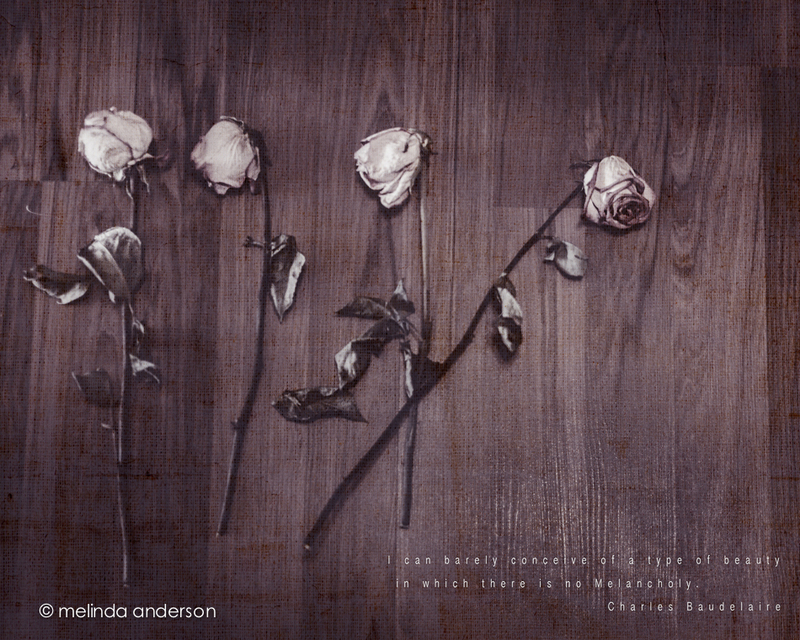 One of the more recent lessons included a preset called melancholy– and a suggestion to revisit the whole wabi-sabi idea, which I loved. I enjoyed creating this image, which is very different from my usual shooting and processing style. And now for a couple random iPhone photos. I didn’t take many photos this week, but did enjoy processing them. 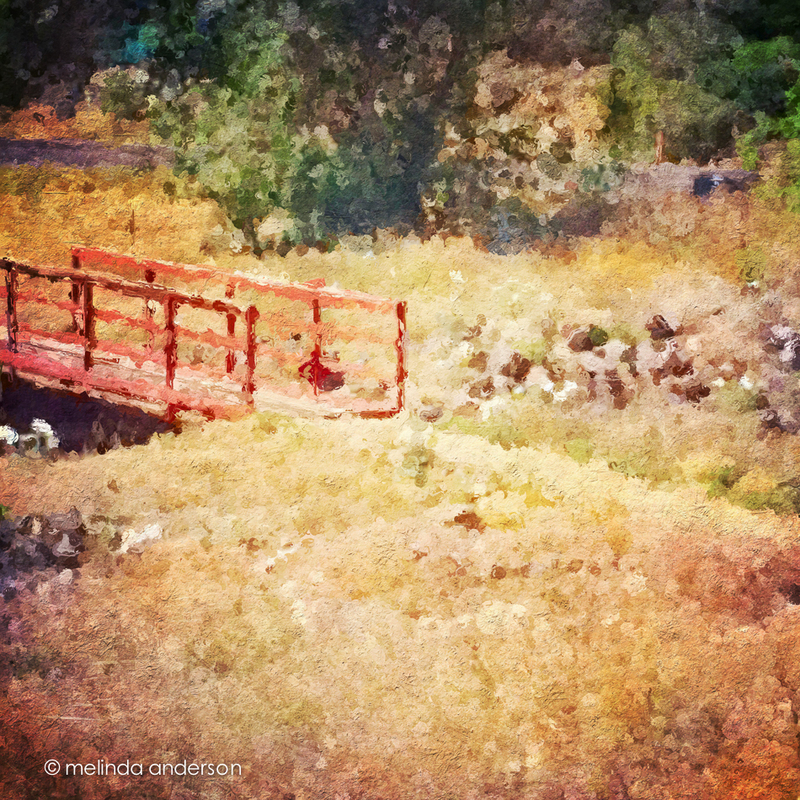 This is the bridge (over a dry wash) that we cross when we walk the trail at Willow Lake. If you look closely, you can see the white southwestern prickly poppies that are in bloom along the trail. The basic edit was in Snapseed- and then I used one of the filters in Glaze (an app that I really don’t understand) and added some textures in Mextures, which also gave it a vignette. The photo below was taken in our front yard and is a closeup of the flowers (and fruit?) of a spiky foundation planting in our flower bed. Now that it’s blooming, I notice this plant everywhere we go in Arizona. Last fall I cut off many of the dried stalks and put them in my old milk can on the front porch. You can see what they look like dried here. I edited the photo in Photo Wizard, which is a great app for basic editing (it even has a curves adjustment! 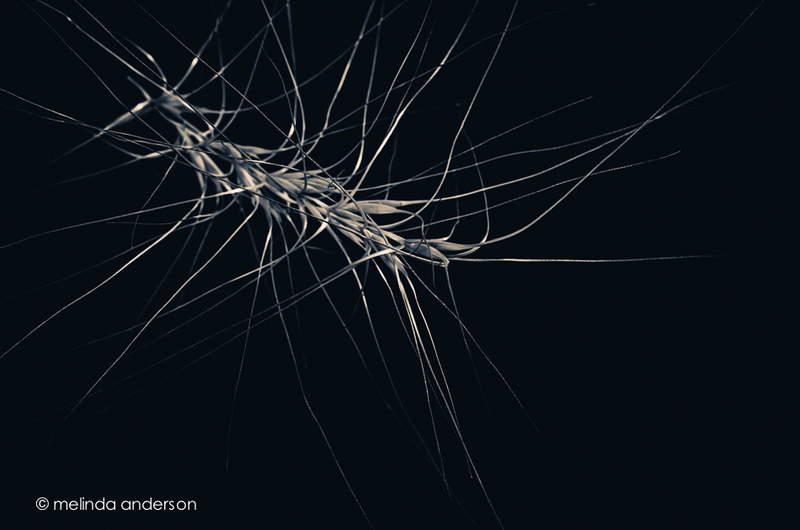 ), as well as having a zillion special filters and effects, from textures and vignettes to motion blur and a bathroom glass filter. I have yet to explore it fully- guess I need to go on another road trip! I’m linking up with App-happy Wednesday again! 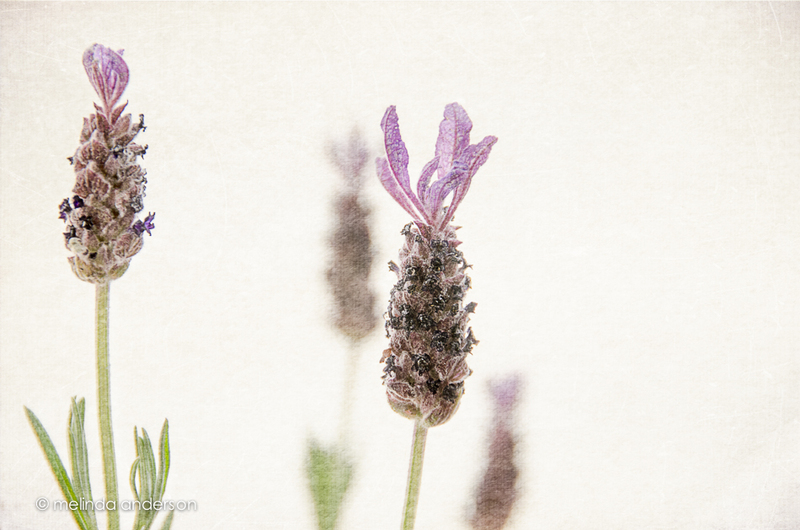 I braved 50mph wind gusts on Earth Day to take this photo (among others), capturing this lavender in a brief moment of stillness. I took this shot with my iPhone of one of the birdhouses in our backyard (left by the previous owner). It is perched on a piece of driftwood, and is very low to the ground. I haven’t seen any birds going in it, but I might be missing something. Do the quail or roadrunners fly up into it??? Seems like the opening is too small. My bird-knowledgeable friends need to help me out here. Several apps were used as part of my process for this image. I forgot that I could take the shot in square mode, thus eliminating cropping it to a square afterward- so I needed to crop it in one of the apps. I used PicTapGo for this and also added a bit of warmth. I found myself really disliking the right side of the photo (rocks and an out-of-focus branch), so I then opened the photo in Snapseed and used the Tilt-Shift effect to blur out the unwanted parts of the image. Next, I added a texture in Mextures and a watercolor filter in Waterlogue. 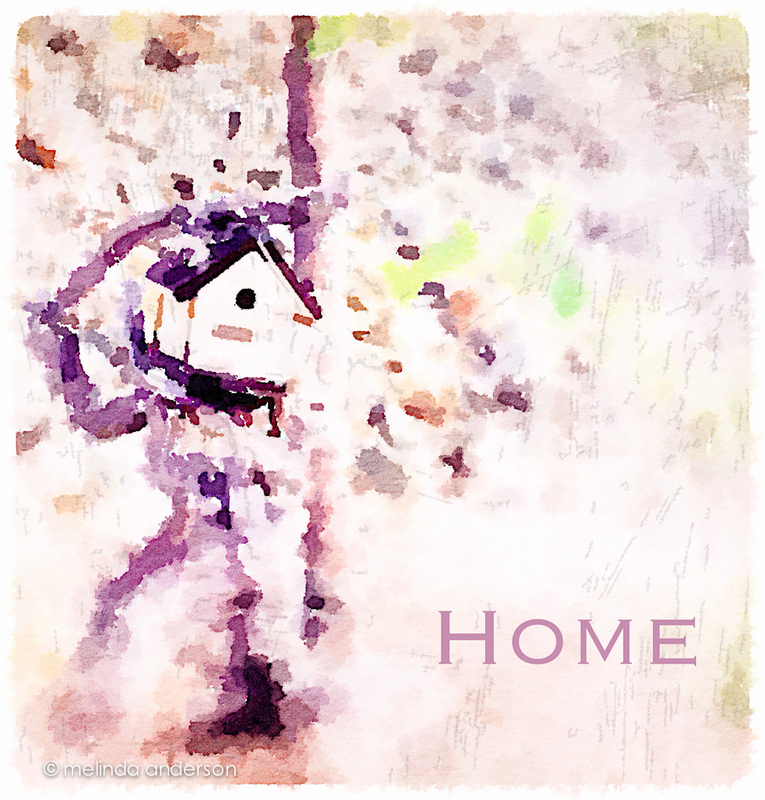 I finished it off by adding the word, Home, in Phonto. Five apps for one photo? Seems a bit extreme, but it worked for me this time. 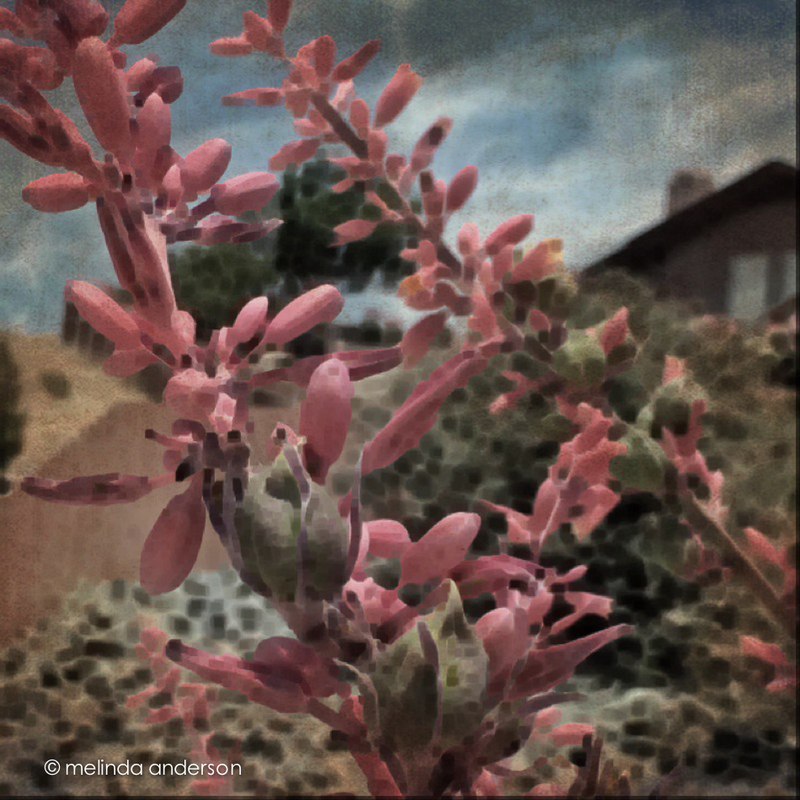 As part of my quest to learn more about iPhoneography, I am linking up today with Barb’s new App-Happy Wednesday on Keeping With the Times. I’m eager to see what the other iPhoneographers have done- I’m such a newbie at all of this! This is seriously FUN! It is easy to edit your photos and make them look like little pieces of art. Most of the apps are free- and the ones that aren’t are inexpensive. Try it! You can figure out all of this in an afternoon. Join me on instagram. I’m #melindaroo. Look who I found hopping around my front yard! This was taken while sitting at my desk looking out through the window. She (I always think it’s a she) visits pretty regularly and hops from bush to bush, where she hides from the hawks and coyotes. I’m hoping to see babies! 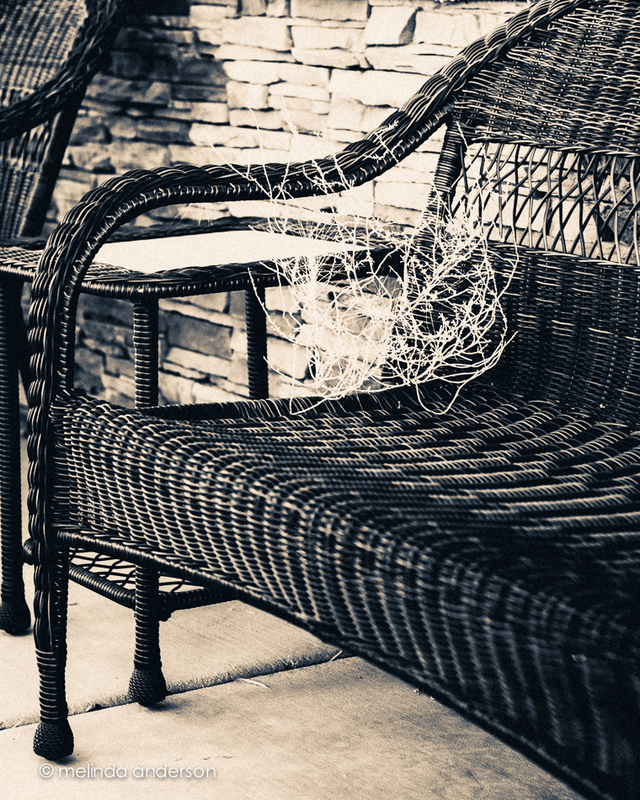 Textured with Kim Klassen’s waterfront 21. Linking up with Friday Finds. 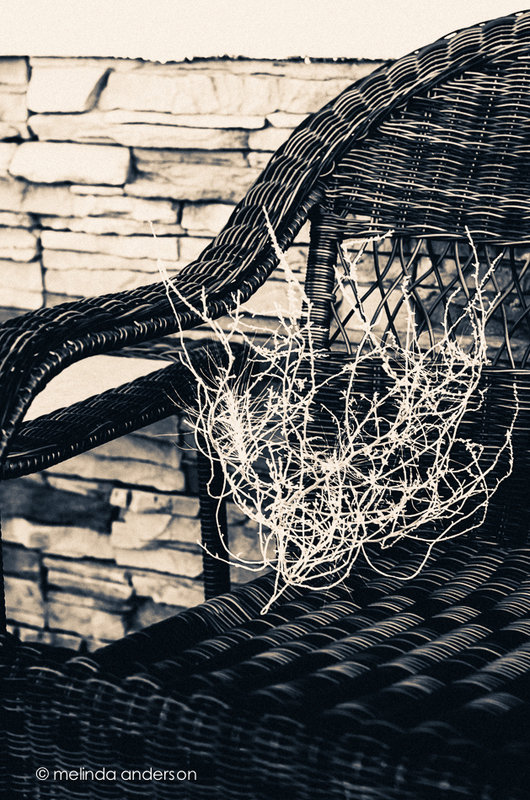 Textures are my own, from one of Kim Klassen’s lessons a few months back. 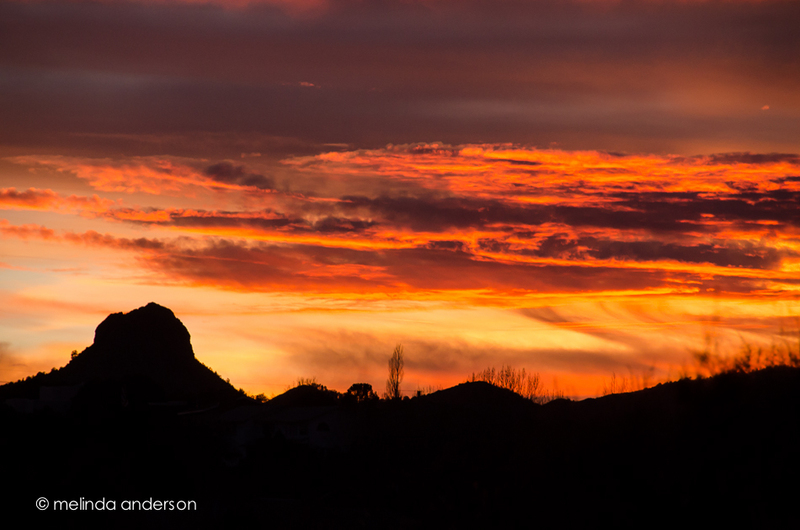 The iconic Thumb Butte, visible almost everywhere in Prescott, was the subject for last night’s sunset shots. Although you can see it almost everywhere you go, I had no idea until a few months ago that you could see it from our yard. Granted, you have to stand in a small corner and lean over a bit to get a good look (or stand hunched over in the bathtub, and peek out the window through the branches of a tree . . .), but we DO have a view! 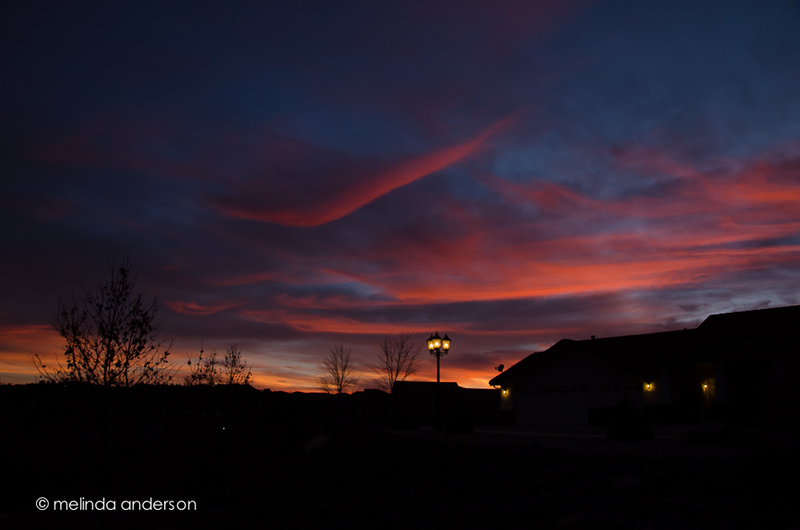 Here’s our house at sunset (yes, I took more house photos. . .). Look at those clouds! 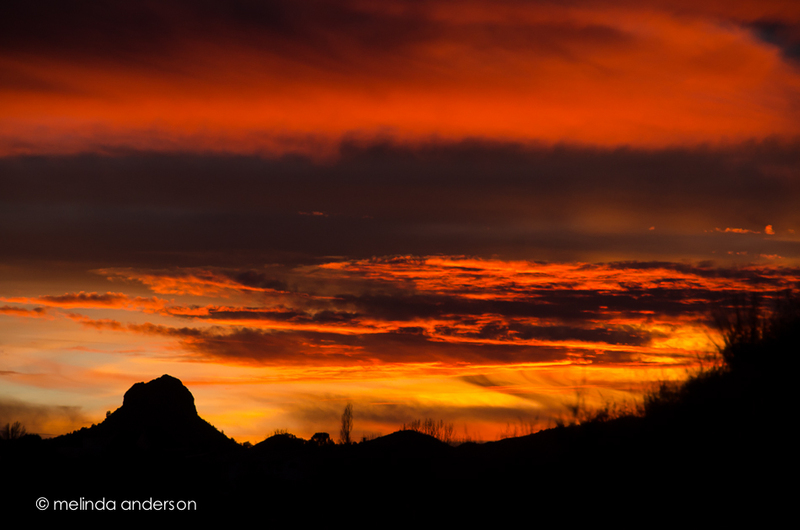 And here is Thumb Butte at sunset.